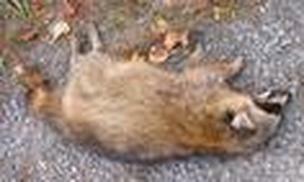 We handle all Forest Grove dead animal removal and pick up problems. Many times people will not know that they have a dead animal problem until it starts to smell. This is due to the fact that the dead animal carcass is being to biodegrade and can be a risk to the health of humans and other animals. It is important to make sure you properly and safely removed, sanitize, and in most cases deodorize the area that the dead animal was located in. The most common are we remove dead animal's in Forest Grove is from underneath a house. The crawl space is a perfect location for an pest animal to live and have babies. It is warm and they can get up into the insulation to build nests. Depending on the access and how large the crawl space is, it can take some time to locate an animal if they have moved into the insulation. The main thing that will prevent dead animal problem at your house is, if you notice there is an entry hole under your house make sure no animals are left inside. This is the main cause for most of our dead animal calls and could have been easily prevented. If you notice there is an entry point under your house and think animals are living under there, we are able to come out and make sure they are all out before sealing up the hole. Dead Animal Removal Skunk Raccoon Beaver Squirrel Coyote Mole, Gopher, or Vole Rodent Bird Bat Attic Clean Out or Sanitation I have NO idea!! The bad smell from a dead animal can stay long after they have been removed. We provide professional dead animal deodorization services that knock down the odor and is not just a cover scent. We have a fogger machine that even spreads out the deodorizers and we use a food grade deodorizer which means it is child and pet safe. The sooner you have the dead animal picked up, the less the smell will stay around. We always recommend have the problem solved properly as soon as you notice you have a problem. Forest Grove Dead Animal Removal Call 503-201-2432!